The Incorrupt Heart of St. John Vianney is Touring the U.S. & Here’s the Dates! 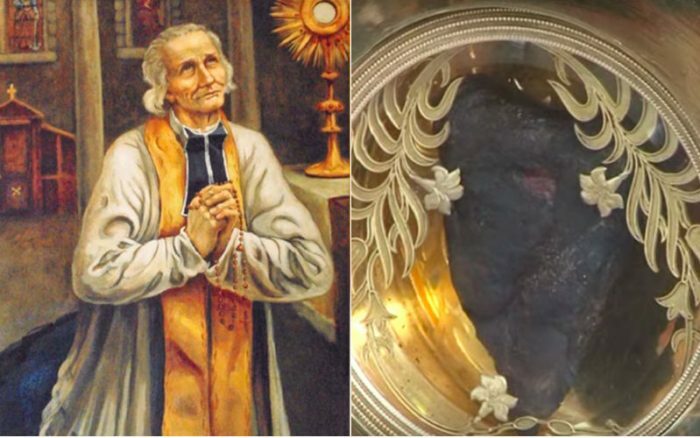 As stated in a recent ChurchPOP article, St. John Vianney’s heart is incorrupt. He died on August 4, 1859. Amazing, huh?! The patron of priests’ heart is normally kept for veneration at the Shrine of Ars in France, but it will tour the United States from Nov. 2018 – June 2019. The Knights of Columbus kicked off the relic pilgrimage in Baltimore, Maryland on Nov. 10. They’ve posted some of the future dates. Check them out below! The Knights of Columbus will add dates, so please check their website for new postings! Remember, the tour goes until June! Also, check out this veneration of St. John Vianney’s relics below. It occurred in Dublin, Ireland in 2010. His heart is a first-class relic! Will you go to the relic veneration? St. John Vianney, patron of priests, pray for us!